Audanika GmbH Sound Prism Pro has a very unique look and style. It’s a style that inspires creative expression in a very new and different way. But, What is it? How do you play this? Where are the keys? Sound Prism Pro, put simply is a professional composition tool and wireless MIDI controller. It features performance recording to create loops and share via audio copy paste between compatible apps. It also supports accelerometer input to control MIDI CC events. It’s an intuitive instrument designed to foster interaction with complex music theory. A delight both audibly and visually. Exploring quickly leads to finding new chord progressions, creating textures, and melodies for your music or just for fun. 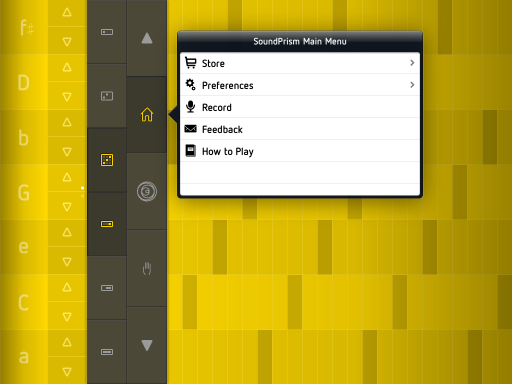 Forget the keys, playing Sound Prism Pro really is a snap. Dragging your finger or fingers across the screen will play perfect chords. In no time, you will be making elegant melodies, and having a great time. Its practically impossible to make mistakes even while exploring different chord design, adjusting the geometric pitch space, effecting tones and complexity. Sounds complicate, but no, it’s easy! Making selections and adjustments in it’s very clean user interface can’t be made any easier. The included preset sounds are few in number having only a total of 8. 4 packed in, and another 4 for available via in app for free download. Other sound packs, and skins are also available via in app purchase. They all sound fantastic, and are a joy to play but, this is only the start. Sound Prism Pro really shines as a wireless MIDI controller for other synthesizers and sound modules. Now with the revolutionary new Virtual Core MIDI (VCM) your library of sound options expands dramatically with compatible iOS synths like NLog Synth Pro. You can run the synth in the background having selected a sound from one of it’s many sound banks, then being controlled and played in the foreground in Sound Prism Pro. It is very COOL! I spent hours exploring VCM with both apps, and was just blown away by the possibilities. This is truly a whole new musical experience and a must have music app for all. 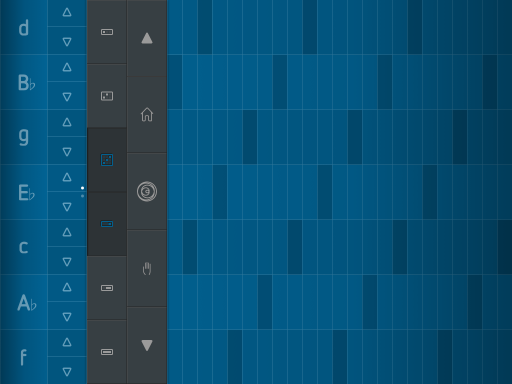 Sound Prism Pro is a very well thought out instrument that is at the front of the technological pack with more joining everyday, pushing iOS music creation to a new level. With incredibly beautiful design you see and hear, nothing was compromised in this professional quality music experience. A must have MIDI controller and wonderful new way to experience and express musical complexities with the simplicity of touch. Absolutely a highly recommended music application. Very well put, your portable music studio. Is that a pic of you? Wow, Qu'el difference!!! Ca ne parrait pas du tout comme toi dave, du tout!!! That was not dirty, lol. I said, wow, that does not look like you..if it is??!!?! Ha…thank you. Yes that's me.